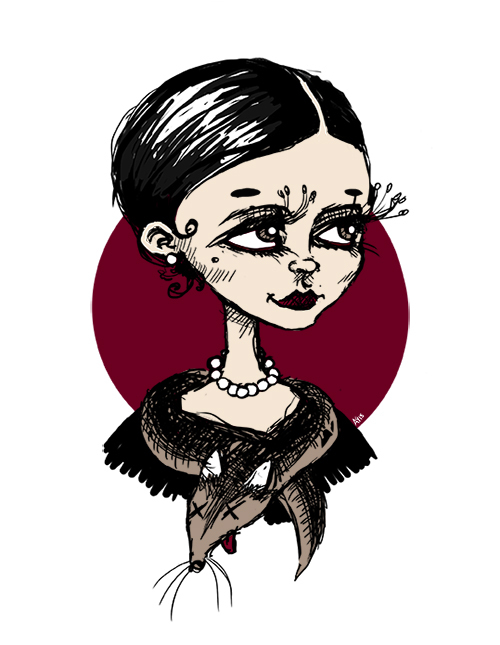 Audrey Elisabet: Sunday sketch | A little late. Sunday sketch | A little late. No, it's not Sunday again so soon.. I wanted to have the Sunday sketch a weekly thing, but completely forgot about it this weekend! So here it is, my sketch a couple of days late. I actually took a really old drawing and worked on top of it. I don't even remember the idea I had for it to begin with but I liked the weirdness of the girl so I started working on it again. She has a little bit of a Morticia vibe to her. School is starting really soon! I was looking at my online classes yesterday and got totally overwhelmed. I have not been in school for over a year, so reading what kind of assignments we are doing this spring and what books we have to read kind of freaked me out. I'm sure it will not be as hard as I am imagining though... I hope not.